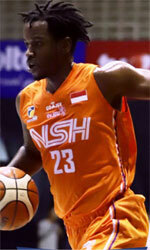 Satya Wacana Salatiga (IBL) landed 24-year old American swingman Ronald Whitaker (201-94). He just graduated from Florida International University (NCAA). As mentioned above Whitaker is just out of the college and it will be his first season in pro basketball. Among other achievements he won NJCAA D1 District VII championship title in 2016. Whitaker received also All-TCCAA 2nd Team award in 2016 at his college time.